Imagine for a moment that you want to make a shirt. So you go to the fabric store and buy some fabric that you like, maybe some thread and some buttons, and you come home and start cutting and stitching. But you didn’t really think about your plan before you started. Part way through, you realize what you really want is a long-sleeved shirt you can wear to a fancy dinner party. But the fabric you bought is a loud pattern, you already cut out the wrong shape, and you only have enough fabric for short sleeves. Now, most people wouldn’t actually do this when they’re making a shirt. They wouldn’t even go shopping without an idea of what they wanted, they’d find a pattern, pick out the right material, and so on. But people do this all the ding dang time with their blogs! They just jump right in and start writing without any idea why they’re doing it — and they waste a lot of time, money, and energy in the process. I see so many people blogging without a plan, and without even knowing exactly what they hope to achieve by it. They seem to think that simply by writing every week they will somehow reach their goals. Sure, you might get a little bit of traction just by writing every week. You might get part way towards your goals just by luck. But if you want to move forward strategically and purposefully, you’ve got to have a plan. Every time you write a blog post, you should know where it fits into your overall content marketing strategy. Your blog is the nexus of your content marketing strategy—so you’ve got to be strategic about what you post. Therefore, it’s vital to understand your reasons behind why you’re blogging. Why are you creating this content for your reader? What do you want them to get out of it? Why are you creating this content for your business? What do you hope to get out of it for yourself? Why are you creating content for your business? The answer is vital. Why are you creating this content for your reader? In my experience the answer to this first question generally falls into one of three categories. A few blogs straddle, at most, two categories. Zen Habits, for example, is a combination of inspiring and educational. For most beginning bloggers, however, it’s a good idea to pick one to avoid getting overwhelmed. Most blogs that support a business fall into the educate category, but not all. My blog is a good example of an education blog; I write about how and why to blog better. But depending on your business, you may fall into one of the other categories. A fitness coach, for example, may want to inspire her readers first and foremost. Rather than posting about how to do certain exercises or lose weight, she might instead share inspirational case studies, before and after photos, research that explains why physical health is so important, and discussions of philosophy or mindset that can inspire people to be more active. A product-based blog, on the other hand, might want to be entertaining. The Warby Parker glasses brand comes to mind; they post book reviews on their blog, which appeal to their ideal customer base. Whatever your big why, understanding it can help you see how your content can help accomplish this goal. Ask yourself: Why are you creating content for your reader? What do you want them to get out of it? What do you want your readers to take away from your content? Why are you creating this content for your business? The second question seems to be the one that people forget. Every element of your content marketing strategy should serve a purpose for your business — from your blogs right down to the tiniest tweet. Otherwise, what are you doing it for? When I ask this question, many people have a vague answer. They want more traffic. They want to build a community. They want to become a thought leader in their industry. My suspicion is that they’ve heard that they need a blog for their business — but they’re not entirely sure why. Your blog can accomplish a lot of different goals for your business, but how you go about blogging will be slightly different for each one. But you have to know which one you’re aiming for in order to tailor your blogging strategy for your goal. In other words, you will blog differently if your goal is to grow your email list than you would if your goal is to connect with other leaders in your industry. Your why for your business will probably change more often than your why for your readers. For example, if your why is to grow your Pinterest following this month, next month you may be focusing on Twitter, or on your email list. Your why for your business also aligns with your sales cycles. If you’re working on a new book of brunch recipes, you’re going to want to blog about brunch to support the launch and sale of that book. The same goes for anything you’re producing or launching. If you’re not launching anything new, you might want to promote a product or service that you’d like to sell more of. A tax preparer, for example, might blog in January encouraging people to do their taxes early. A fashion stylist might write about her closet sort service in July because it’s her slow time for styling. Understanding why you are creating content for your business dictates the kind of content you create. Knowing your why is the vital first step in creating an editorial calendar strategy for your business that will truly support what you want to achieve. Ask yourself: Why are you creating this content for your business? What do you hope to gain from blogging? Once you have the answers to these two questions, you are primed to plan and create content that will actually move your business forward and get you closer to your goals. Interested in learning more about the next steps in planning your editorial calendar? Click here to read more about managing your blog ideas and creating an editorial calendar that works. Such good info. I’ve been struggling with my blog but you’ve made me realize I need to just block off dedicated time to figure out the whys and whats. Made my day, Thea! I love hearing that I’ve been helpful! I have taken a bit of a break from blogging to regroup the past couple of months, and am now getting back into it. This was a great read to get me back on track! Awesome, Lindsay! Let us know how it goes!! What a great post. I agree that most people might consider why they’re writing for their reader. I’m definitely educate with a dash of inspire. 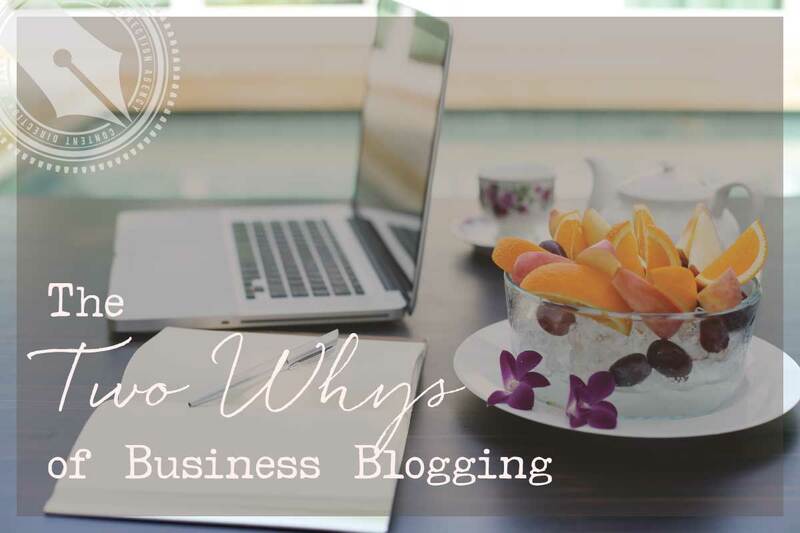 But don’t team that with why you’re blogging for your business. Not only will that make it more effective but it will be easier to come up with content ideas because you don’t have all the options in the world. So glad you found it useful, Kerryn!